Chickens need entertainment so that they won't cause trouble. 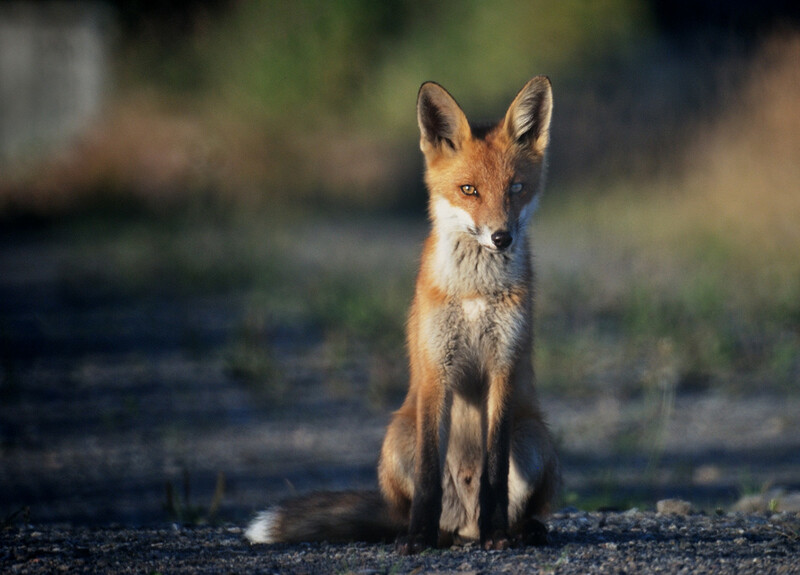 Like all animals, they can get bored and develop bad habits if left unoccupied. Not all chickens can be allowed to free range, but even free-range chickens crave fun activities to do. Luckily, chicken toys are all around you, waiting to be used for lots of fowl fun. It's also entertaining for us to watch them play. Chickens are curious and interested in the world around them, but the main things that will catch their attention are food and shiny things. It's important to realize that birds are not like dogs, so they aren't likely to do things simply to please you. Nor are they like cats that will chase after most anything. Food is the main driving force for chickens. Toys that involve eating are going to be the most popular, and therefore, the most useful. Even chicken scratch can be used as a toy if it's tossed in their bedding or in a compost pile where they can dig around for it. This can be a dual purpose activity: the chickens have fun looking for the bits of corn and grain, and they're also mixing the compost or bedding for you. Even when playing with the birds in a way that doesn't directly involve food, you can make them interested by giving them a treat for doing what they're supposed to. Rewarding them for pecking at a piano key will quickly make them realize that pecking on the piano will get them food. Chickens are not the smartest animals. Be willing to work with them and be patient while waiting for them to figure things out. It's important to remember that moderation is key. Don't force your chickens to perform all the time to get their treats. Once a week or twice a week for non-strenuous activities is good, but you don't want to stress your birds. It's not good for chickens to constantly run, jump, and chase stuff. Too much jumping can negatively affect a hen's laying. Making a heavy bird jump too high too often can also lead to leg problems. Make sure they're going to have a safe surface to play on. A heavily pitted area should not be used for jumping or running, and a slick surface can be dangerous as well. Squabbling can break out if there is too much competition and some of the chickens don't ever get treats. Flocks will often compete anyway, but if it crosses the line into overly-aggressive behavior, you will need to make an effort to play with everyone equally or play with only half the flock at a time so everyone has a chance. Just use common sense and everyone can have safe and rewarding fun. Cabbage as a chicken toy. Lettuce tetherball is fun too! Most fruits and vegetables make great toys, especially ones that roll. Almost all fruits and vegetables are safe for chickens to eat, with the exceptions of potato peels, onions, and avocados. Hang a head of cabbage from a rope so they can jump up and rip off pieces. Get their attention and then throw a piece of fruit, such as a peach, across the yard so they can run over there and eat it. Toss small items like berries and green beans into their bedding so they have to dig through it to find the treats. Roll peas across a flat hard surface, such as a patio, so the chickens can race to get them. Pack an old rotting log with banana. Place frozen peas into a small kong-type toy that you'd normally use for a dog. Then show the chickens that if they roll it around the peas will fall out. Hang leaves of lettuce from a clothesline. Toss small pieces of fruits and vegetables into the air so the chickens can jump and grab them. A pumpkin or other squash broken open in the yard is fun for them to dig through. It also naturally attracts worms. Once they are used to broken squash, you can place whole ones in the yard for them to peck at. Cut a watermelon in half. It rolls as they try to eat it. 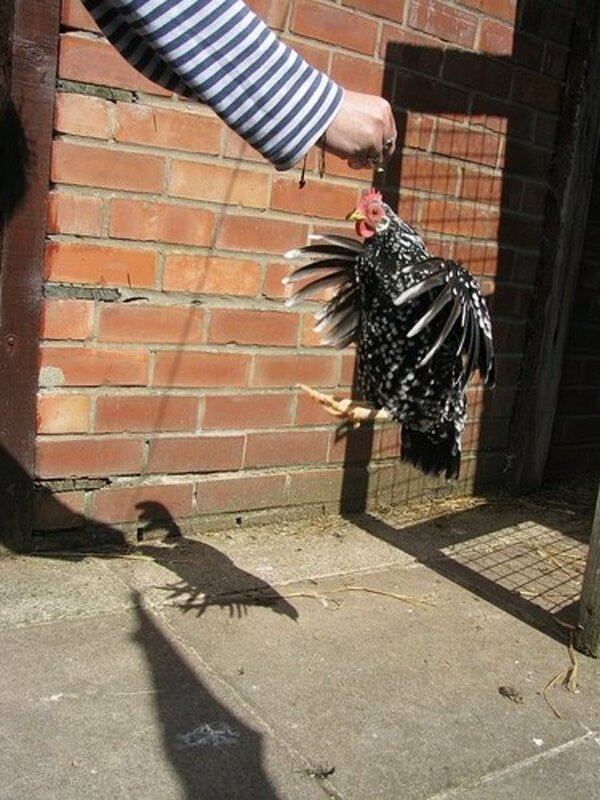 You can also cut it into rings and tie them up so the chickens have to work to get at them. Frozen cubes work great here too. If you have a bag of frozen cranberries, roll the bright, shiny berries all over the ground for them to chase. Dangle a cucumber with a rope through it so they can jump up, peck at it, and eat it. 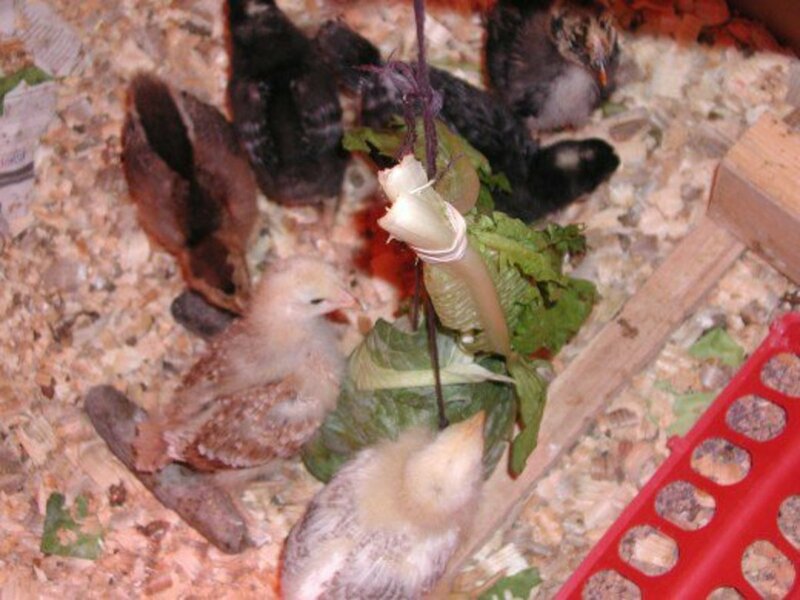 String several harder fruits and vegetables onto a rope and tie both ends up to make a shish kebab for your chickens. Leftover baked goods or ones you make specifically for your flock can be a lot of fun. Just be cautious because bread that is too soft can be a choking hazard. Baked, hard rolls roll really well and are fun for the chickens to chase. Throw hard rolls and the chickens will play fetch, but don't expect them to bring anything back to you. A loaf of french bread threaded onto a rope and hung from the ceiling makes a fun target to jump and rip bites off of. Small rolls studded on their fence are great for them to peck at. Bagels and non-frosted donuts are good to hang around the coop. You can also hang them from the ceiling or roll them across the ground. Bake some cookies to hang around the yard. A simple batter such as that for biscuits or cookies without sugar works well. Incorporate some peanut butter, seeds, and grains and bake until cooked through. If you cut holes in the middle before cooking, they'll be easier to hang. Bread and fruit are not the only food items that make good chicken toys. There are all sorts of items you might have in your kitchen that they might enjoy. You can spread chunky peanut butter on items around the yard, such as rotting logs, to give the chickens something to peck at. Peanut butter also provides them with extra protein. You can spread cooked rice on rotting logs as well. Cooked pasta, depending on the shape, can be hung in low bushes for the chickens to jump and peck at. Roll hard boiled eggs across the lawn for them to chase and tear up. Pour yogurt into a bag and poke a small hole in it. Then hang it up to let the yogurt drip. The chickens will try to catch each drip that falls to the ground. You can do the same thing with a punctured milk carton. Meaty bones are fun for the chickens to clean up. They can also drag them around the coop when playing keep-away. Sprouts are a special favorite. 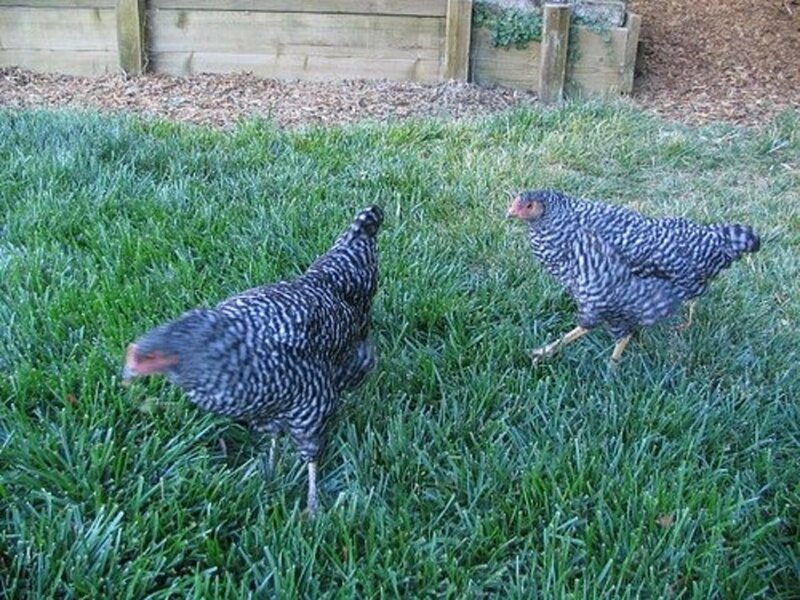 Scatter them across the coop bedding for a game of hide-and-seek. You can spread cornmeal, oatmeal, or grits on logs for the chickens to scrape off. They will enjoy pecking at the food in all the little nooks and crannies. You can string cereal, like Cheerios, and hang them in the coop or on the fence line. You can also scatter it around for them to find. Roll a pine cone in peanut butter and then dip it in bird seed. Hang the pine cone in a place where the birds can peck the goodies off. Make suet out of used cooking grease, seeds, and peanut butter. Hang it for them to jump at. Freeze some larger treats inside a block of ice. It's a great way for chickens to cool off on a hot day. Often, baby and toddler toys make great toys for chickens. The bright colors and interesting textures and noises are designed to attract. Shiny, kid safe mirrors can interest the birds for a while. Make sure that they won't attack it hard enough to break it. You can coat plastic rings of keys with peanut butter and toss them to the flock, or hang them from a low spot for the birds to peck at. Set up plastic kiddie gyms for the chickens to play with. Wrap some kind of food around it for lots of entertainment. For something a little more challenging, stack colored donut rings, and then hide something in the middle for them to find. 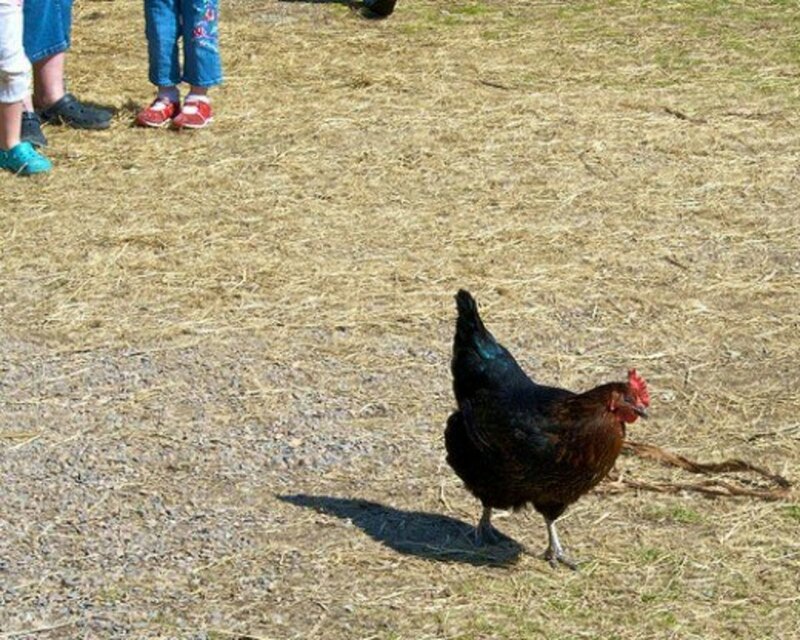 Chickens also like wind-up and walking toys. You can keep the birds occupied by tossing a lightweight ball into their pen for kicking around. The moment I saw this at our state fair, I felt I had to do it for my flock of chickens, turkeys, peafowl, and guineas. What you need to do is fill the bed of a remote-control truck with scratch and release the birds. You then put the pedal-to-the-metal (in this case, put the joystick-to-the-plastic) and away they all go! Can you picture an entire flock of chickens chasing down a toy truck? Think outside the box when it comes to chicken entertainment. What do your chickens like to do? What makes them happy? Here are some other fun ideas. Hang a sunflower in the coop. Scatter insects and bugs, such as worms and crickets, in their coop for them to chase. Old CDs cast interesting patterns on the ground when the sun reflects off of them, and they also move in the wind. Sprays of millet hung about the coop are fun for jumping and grabbing, and then chasing if they manage to get a spray loose. Give them a chunk of sod with the dirt and roots attached. They will dig and scrape through it looking for little tidbits. A rotten wood log stuffed with whatever you have available makes a fun toy that will keep your chickens occupied for hours. 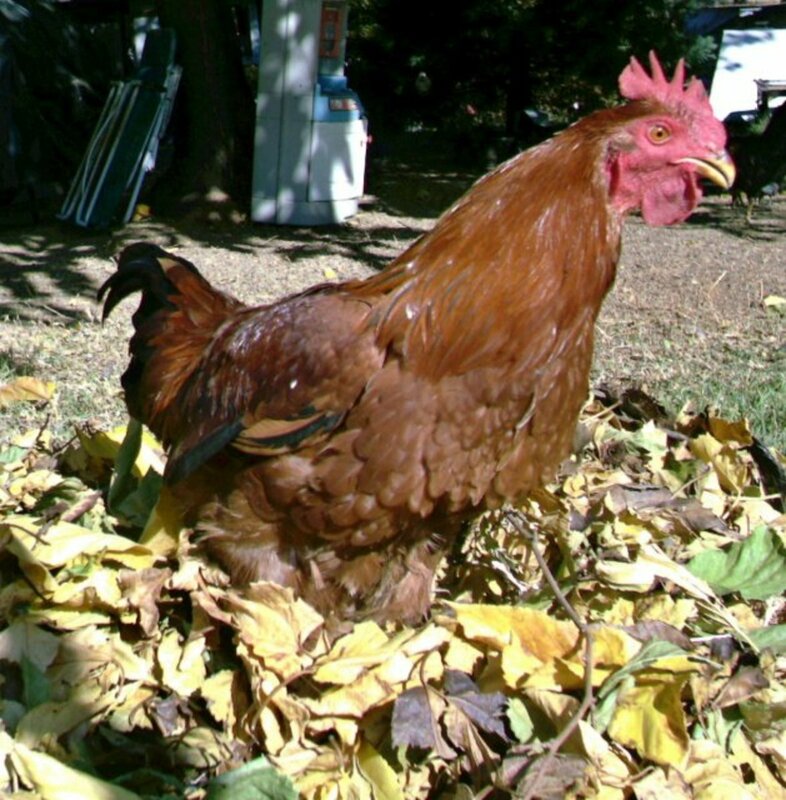 Let your chickens play around in a pile of fallen leaves by hiding bugs and other yummies in it. Take a handful of weeds that are safe for the chickens to eat and tie them up for the birds to jump at. You can also just toss them over the fence. A suet cage stuffed with whatever treats are handy makes a nice little piñata. Take so plastic Easter eggs and poke holes in them. Then fill them with seeds and roll them around. The seeds will fall out as the chickens chase them. You can also use a sturdy container, such as a plastic tub or coffee can with holes poked in it. Cricket tubes (tubes designed to release only one cricket at a time) will give the chickens hours of entertainment as they wait for each of the yummy creatures to venture forth. Layer some bird seeds in between sheets of newspaper, so the birds have to work to get it out. Put tree stumps in their area for the chickens to sit on top of. A good view makes a world of difference. 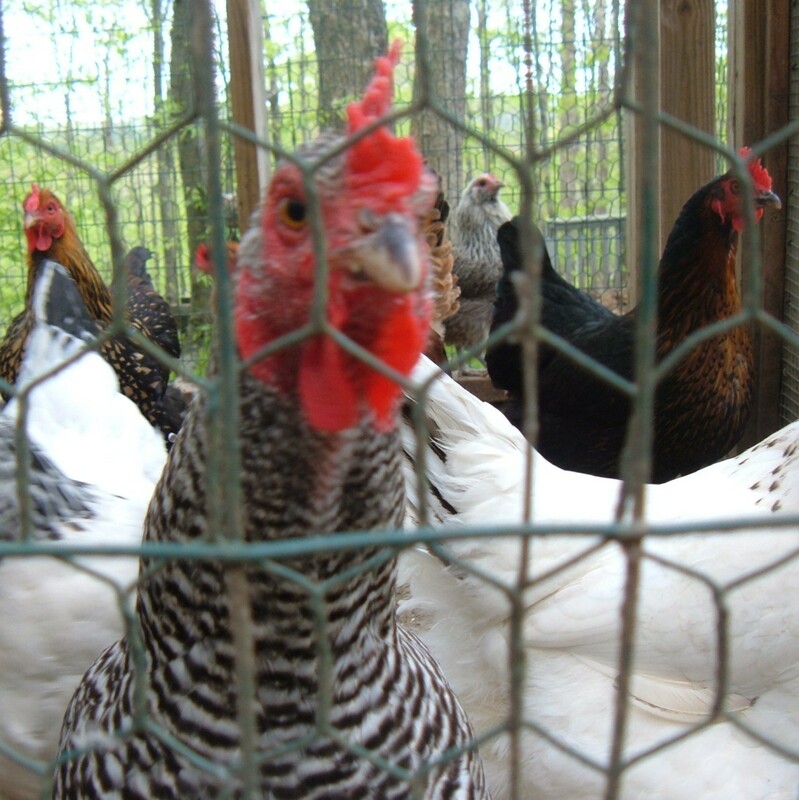 Perches inside their pen will make the chickens happier as well. Remember to change them up occasionally. A different view makes the same old area into a different world. Find a nice large branch with several branches coming off of it. Then stand it up inside their yard. They'll love to perch on the branches, so make sure it's sturdy. Put some sand in a box for them to use as a dustbath. What's Your Favorite Chicken Toy? What do you think of the ideas on this page? Are going to try some of these ideas? Do you already give your chickens toys? Share an opinion, a recommendation, or a story in the reader feedback section below. If chickens aren't supposed to jump, why do the activities ideas in your article include jumping? Jumping is a natural part of chicken behavior. In the wild, they might jump to get a bug, etc., but domesticated chickens have been bred to be heavier, which means jumping can put too much strain on their legs. Jumping needs to be done in moderation. Don't put things too high or make them do it too often. Understand your chicken's breed as well. Lighter breeds and banty chickens are safer to jump than heavier breeds such as Orphingtons or meat birds. Just as you could jump a little to grab an apple off of a tree and would be fine, but doing a high jump could hurt you, chickens can jump for treats but only in moderation. Keep their body type in mind. How do you make chickens less greedy while eating their food? Chicken retain some things from their dinosaur ancestors, including an aggressive eating style. Nothing is really going to completely counter that, but you can help slow them down a little. Fresh fruits and vegetables can be hung up so they have to work a little. Put seed into something that only spills out a little at a time so they can forage. Scatter scratch in your compost pile and let them have fun finding it while also rotating your compost. And in their food bowl you can place a couple large rocks so they have to work around them to get food. Also, make sure they are getting enough to eat. Chickens need to eat a lot, especially if they don't have an area to graze. Competition can be fierce, so make sure you have enough feeders so that everyone can eat at the same time. 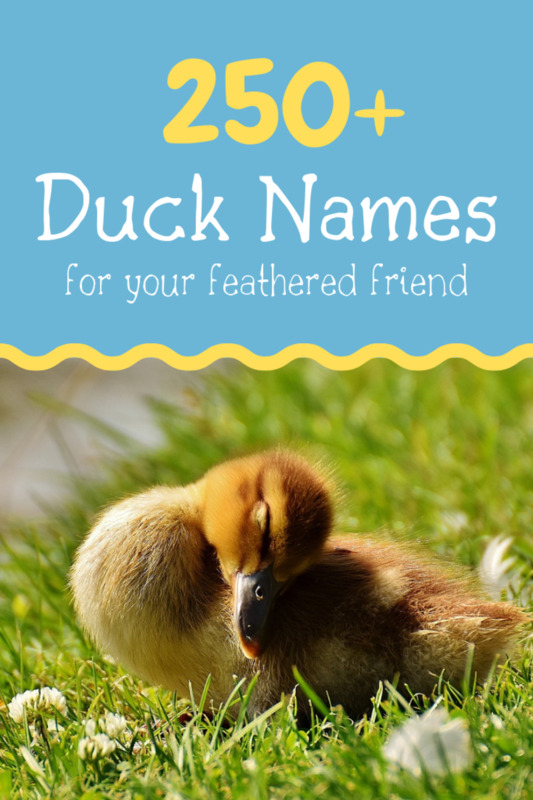 Can some of your ideas work for ducks ? My dad raises hens and one got broody and one (only) egg hatched. I have her separated (the others were pecking her) and she seems bored. She's only one week old. Ideas? Also if you want something else that will keep your chickens happy for a while and doesn’t need food. You can roll up some glad rap and throw it to a hen. Though it won’t last long you can do it again the very next day. The chickens will chase the ball and pick it up. Then they’ll chase whoever has it. Just make sure they can’t eat the ball and that you take the ball off them once they’re done! They love bells to ring, mirrors, xylophone to play music, colorful wooden beads to slide back and forth on a small wooden stick, they love roosting bars, dust bath areas and love pecking at melons. Thank you very much for this article! About a month ago I found a lost hen (she was about 2-3 months old) in the forest, freezing under a thick layer of snow. I took her home and made a hen house for her. She's now running on my yard, but she often gets bored, so this article really helped me, I want her to stay and not get bored, Bella is my new friend now, so I want to take a good care of her. Thanks again. My chickens always look for trouble. I hope these ideas work! My chickens were free range but had to be penned for a few weeks. I circled wire around a large tree for shade. One hen kept getting out. I hid to watch how she was doing it. She'd walk from the wire to the tree trunk, back and forth while looking up with one eye. Back and forth. Finally when at the trunk she hopped up to a branch and walked along it until she passed over the fence line, then hopped down to freedom. I am so happy that I was able to see this from beginning to end. The reasoning and planning she used to choose the best branch that would hold her weight as well as extend out of the pen shows a wonderful thinking process. I've had chickens my entire life. If you allow them to be, they are affectionate and make great friends. How privileged I was to witness the level of intelligence she applied to accomplish her task at hand. My older birds love a cinder block and an old plastic kids slide that has 2 steps and is low to the ground. My 4 week olds like chasing wiggles from the bait store. I disagree with the "chickens are not the smartest" comment. 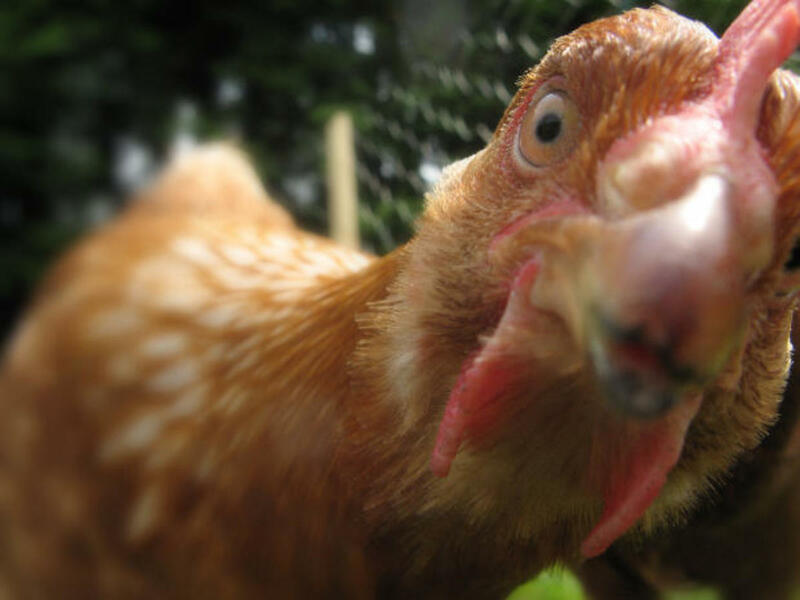 If you read the research done on chicken intelligence, they are actually surprisingly intelligent. My chicken toy is a stick they folow it so, they go in circles, jup up and were ever the stick goes the chooks go. My girls might LOVE some of these. Thanks. For everyone; Just remember that if you give them beans they have to be thoroughly cooked. Just don't give them old / rotten food, avocado, chocolate, green tomatoes or potatoes. Really interesting, had no idea about most of these ideas. I tried the cabbage idea but our weren't a fan, I might squish some peanut butter & seeds around it & give that a try... Thanx for the whole article & for everyone's comments. Love the videos, hilarious! I really liked your ideas esp the one of old cd and plastic easter egg. Never thought of giving the chickens toys when I had some in the backyard. They did have the run of the yard though, so had plenty to do. I had no idea chickens liked toys. I think the best toy for a chicken is a grasshopper. My darling little chicken just loves her half head of cabbage when I tuck some seed down in it. She has a blast "digging" out the seeds. Cute ideas for chicken toys. This is a great list, but I would advise against the hard-boiled egg enrichment object if you are keeping hens for laying purposes. 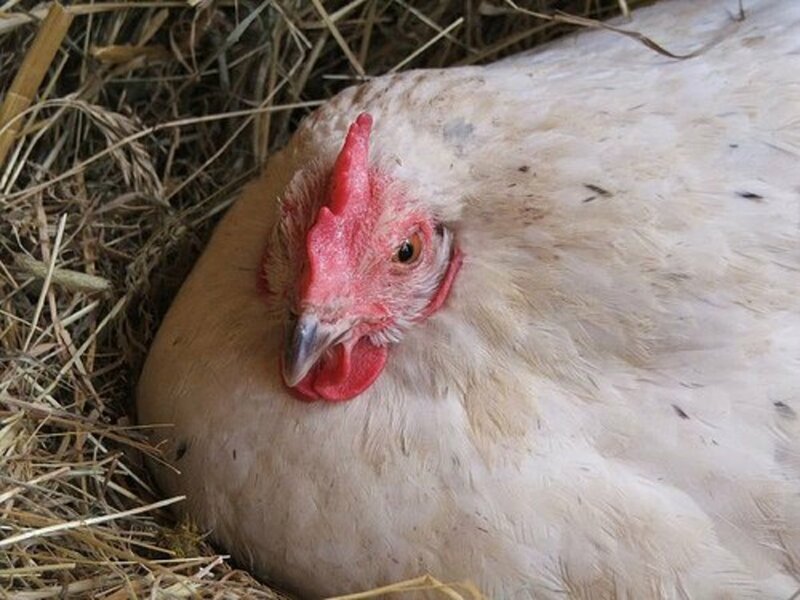 While it's perfectly safe and even advisable to feed crushed eggshell and scrambled eggs to your birds, feeding them something that is still in the shape and appearance of an egg will encourage them to eat their own when they lay them, and you'll end up with no eggs for yourself. If you're just keeping the birds for meat or as pets, it's not a problem. Thanks for sharing! That was very helpful to me. 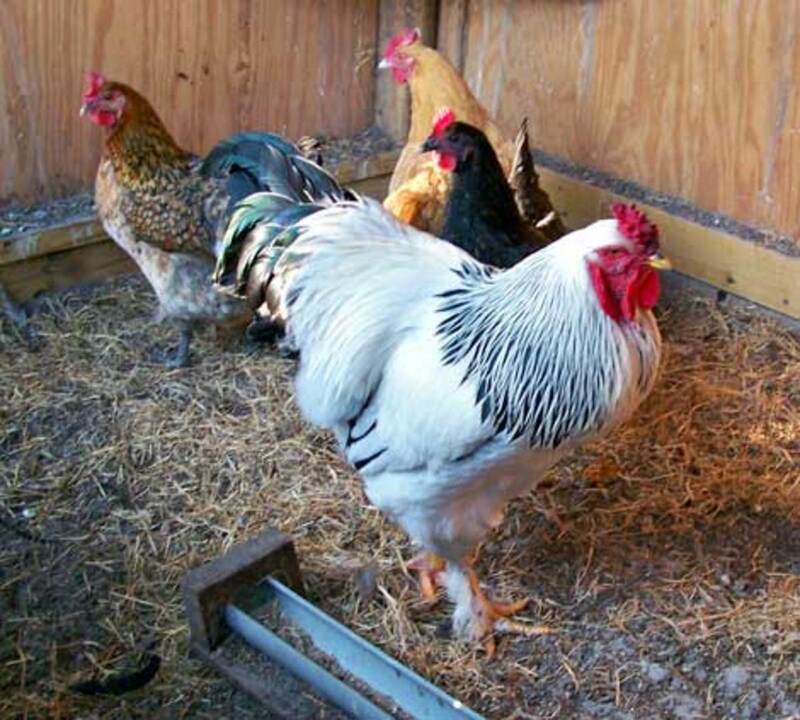 Hurricane Sandy will be arriving in a day and the chickens will not be happy in their coop for an extended amount of time so your ideas will definitely keep them busy! Thanks again! I haven't seen or heard chickens for a long time, but this brought back memories of visiting my grandparents farm. I had chickens many years ago but never thought about giving them toys to play with. If I had chickens today, I would definitely give them some of the toys you mentioned on this great lens. I really like the photos of your chickens playing. Thanks. 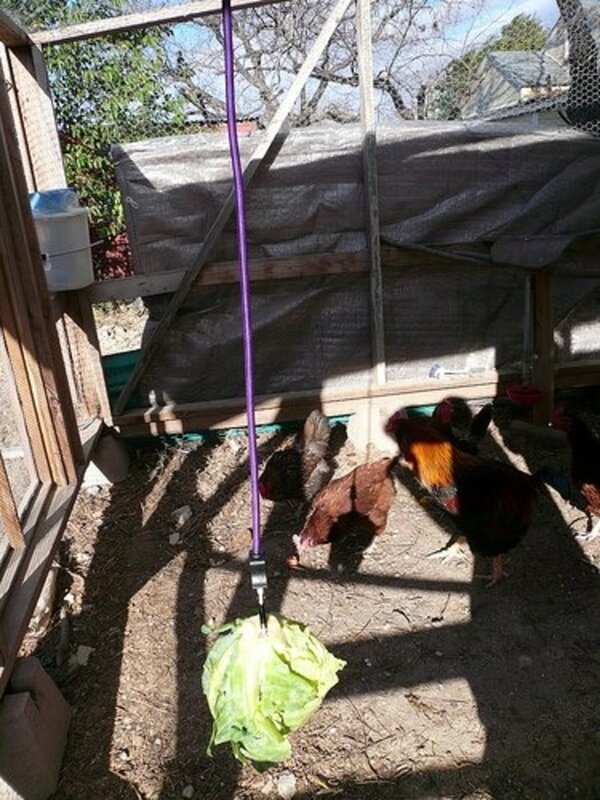 I did the lettuce hanging from a string and it was a big hit with my hens! i love the cabbage idea! and my chicken loves it too! Great ideas! I love chickens, you have beautiful birds. A mirror is a superb toy for a chicken who has to be alone for some reason. Ours hung out right by it! how about a hanging bell??? Must do all of this for my chickens starting today! This really helped me to entertain my baby chicks. They love all the fun toys! Great resources listed! Blessed and liked. I sent a link to this lens to my chicken-raising neighbor. Thanks for the fun info! I got a chuckle when I read the title of your lens. It brought me back to a teenager in South Africa and a pet chicken I had. He would jump on my shoulder and stay there as I walked around the yard. Then I would put him on the ground and point out insects for him to eat and he diligently ate them all up. Unfortunately, I was not around one day and he was became a meal for someone. Made a great little pet tho - surprised me how personable he was. Thank you this has been so very very helpful!! The first persons answer was good. If you can't find the ball he is talking about you can try wrapping string around some cabbage or some fruit and hang it up. When they peck at it, it will swing make one a little high so they have to jump. They also like the color red, an apple would be good. Hah! Someone after my own heart! Love this lens and am squid angel blessing it! Great sensible ideas. My girls jump for leftover pancakes and waffles!! The hanging cabbage is great in the winter and I grow lots of cabbages just for my chickens. They will eat hanging Brussel's sprouts and kale too in the dead of winter, but the cabbage lasts the longest! Check out our new chicken toy at http://www.loveyourchicken.co! I found only one toy after searching for a very long time! My chickens love it, its called a chicken ball they get to play and eat at the same time. I found it on this website eggcartons.com. Here is the exact link though. 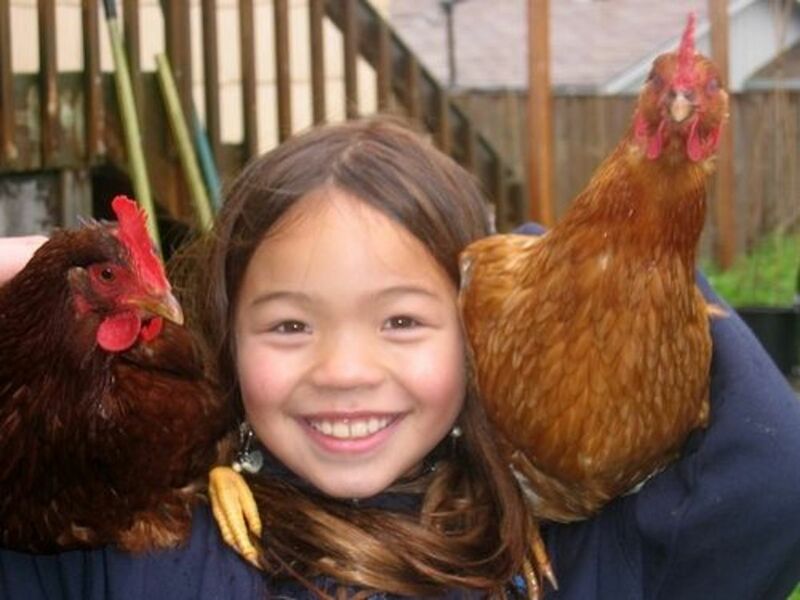 I had chickens as a kid. what a great site and great ideas. I will definitely try some of these. Great site. My chickens are definitely going to get some toys! We love this lens! My chickens are only 7 weeks old and just moved into their new coop. (I have a lens about them). Since reading this lens, my chickens are definitely going to be getting some toys. What fun! Love it! The cabbage made me laugh out loud! Few things I like better than smart articles that respect animals for the unique creatures they are. Nice. I stumbled it. Hope it draws some readers for you. Oh goodness, I never thought these ordinary things could be toys! They peck at all the apples and plums that fall from our trees but only a few pecks out of each one. It never occurred to me this could be the chicken version of a game! Mine adore spaghetti and suet, too. Even the shy ones will race to take suet out of my hands. I make cornbread for them on occasion and peanut butter sandwiches. A couple have me trained to turn over rocks and bricks to look for earthworms but I guess that would be me being trained by them. And grubs! Oh do they come running for them, hens and roosters all trying to grab the ones I dig up. Gardening with them is always a challenge because they'll stick their heads right under the shovel or hoe to grab one. Our house chicken LOVES to help crochet. By "help" we mean "peck and footy-dig the fabric/yarn ball." When we leave her alone for more than an hour, I leave her any one of several DENSELY crocheted bits of fabric as a footy toy. I make and give her different colors for stimulation. She loves the variegated yarn ones. She also loves a pile of folded laundry--she will kick and pick through a stack of it until it's in a nice rounded pile. Then I refold it, and she starts over. In our long rainy winters, we keep a box of mossy twigs, wood chips, and the like for her to poke through. She is also very fond of socks, and gets our old wool ones that are past repairing. She will dig and peck and scratch at them, and sometimes nestle down next to one. Cute ideas. My hens help we weed the flower beds. They come running as soon as they see me pull a weed. The sow bugs and centipedes scatter, but none can hide from my 3 girls and they have lots of nutritious fun. 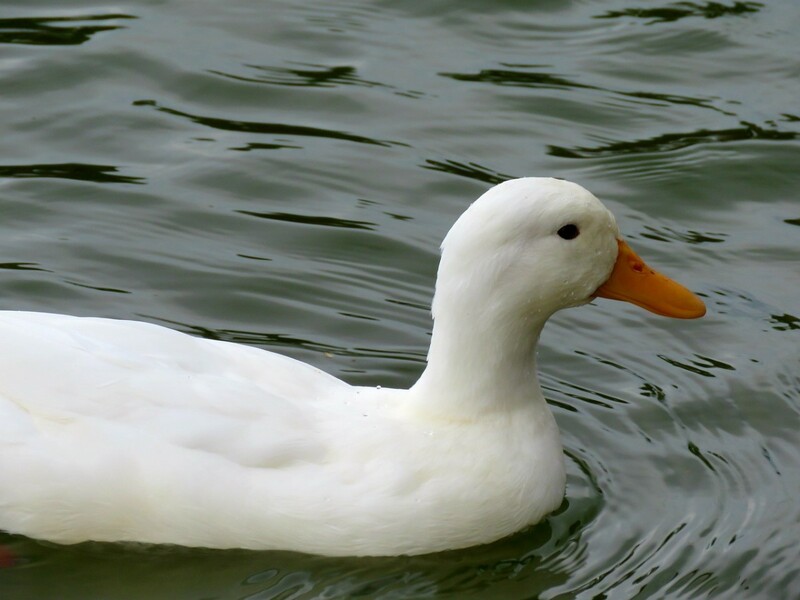 Your lens has been featured on Angel of Farmyard Animals blessings. I'll definitely use some of those ideas once I got my resuce hens :-). thanks. Great ideas to entertain my chickens and turkeys. Yes, I agree, chickens need enrichment activities. Great Lens. 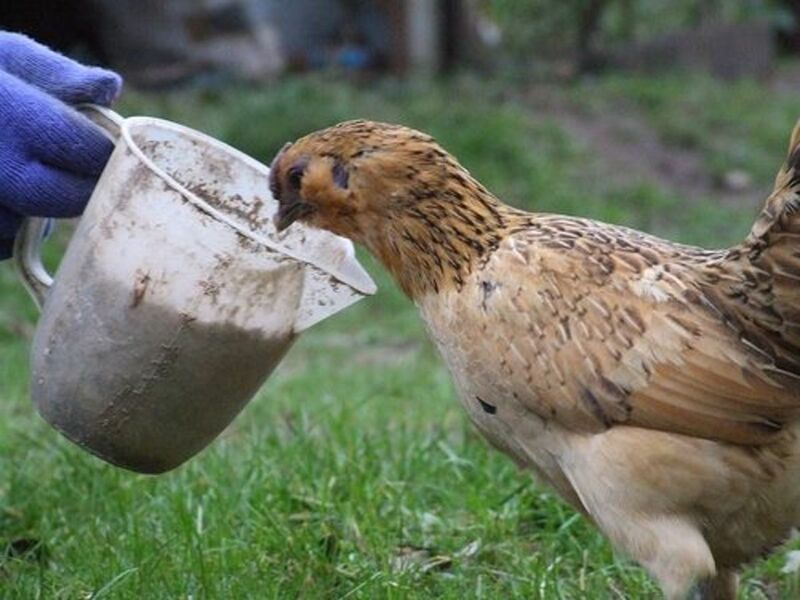 Cool :) We like to give our chickens a litter tray full of dry compost when the weather is wet - it gives them a nice dry dust bath, which they really appreciate and will use for hours. Toys for tweets! How cool!